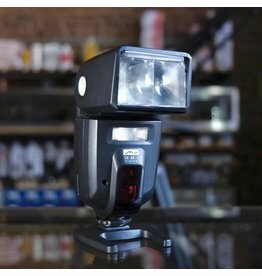 The Metz 58 AF-2 Digital flash is a powerful flash unit for Canon EOS Digital cameras that supports E-TTL and E-TTL II function. 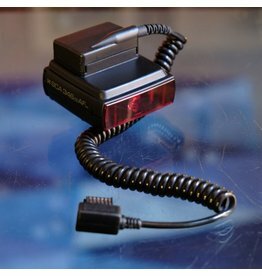 In good working order, this flash has some cosmetic scuffs and scratches, none of which affect function. This Metz Mecablitz M400 is a compact, powerful flash unit for Fuji X-mount cameras. 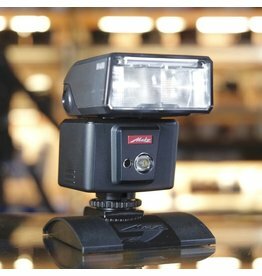 It features a guide number of 131ft, a tilt-swivel-zoom head with bounce card, full manual or TTL functionality, and a built-in LED light for close-range video shooting. 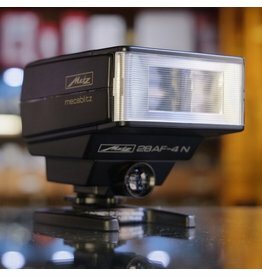 Metz 28 AF-4M flash for Minolta Maxxum film SLR cameras. Low-profile design and tilting head. Includes original box. Metz 28 AF-4M flash for Minolta Maxxum. Metz SCA-346/2 AF M4 TTL adapter to connect Nikon film cameras to Metz SCA-compatible flash units. In excellent condition. Metz SCA-346/2 AF M4 TTL adapter for Nikon film cameras.